Hoppler-KD-3-1: It is a Ball Pressure Viscometer.During measurements, a ball moves at a definite load through the substance being investigated in a measuring vessel.The dropping speed of the ball is a measure of vicosity.That speed is registered automatically, processsed by the computer and displayed as a dynamic viscosity. More than 70 years ago Fritz Höppler developed the Höppler-Rheoviskometer which is based on the patented ball pressure method. 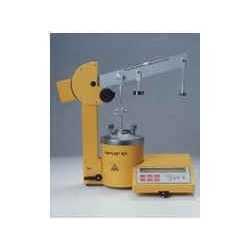 It is used for viscosity determination of lightproof fluids which have a wide range of viscosity.